(Nanowerk News) Composites are combinations of materials that produce properties inaccessible in any one material. A classic example of a composite is fiberglass – plastic fibers woven with glass to add strength to hockey sticks or the hull of a boat. Unlike the well-established techniques for producing fiberglass and other macroscale composites, however, there aren’t general schemes available for making nanoscale composites. Now, researchers at Berkeley Lab’s Molecular Foundry, in collaboration with researcher at the University of California, Berkeley, have shown how nanocomposites with desired properties can be designed and fabricated by first assembling nanocrystals and nanorods coated with short organic molecules, called ligands. These ligands are then replaced with clusters of metal chalcogenides, such as copper sulfide. As a result, the clusters link to the nanocrystal or nanorod building blocks and help create a stable nanocomposite. The team has applied this scheme to more than 20 different combinations of materials, including close-packed nanocrystal spheres for thermoelectric materials and vertically aligned nanorods for solar cells. 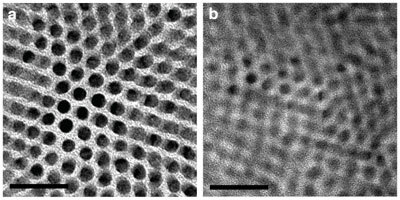 These transmission electron microscope images show (a) the original nanorod array of cadmium sulfide and (b) a composite made from cadmium sulfide and the chalcogenide copper sulfide. In the composite, nanoparticle ordering is maintained but spacing between the particles decreases. The researchers anticipate demand from users seeking this latest addition to the Foundry’s arsenal of materials synthesis capabilities, as this mix-and-match approach to nanocomposites could be used in an infinite list of applications, including materials for such popular uses as battery electrodes, photovoltaics and electronic data storage. “The beauty of our method is not just the flexibility of compositions that can be achieved, but the ease with which this can be done. No specialized equipment is required, a variety of substrates can be used and the process is scalable,” said Ravisubhash Tangirala, a Foundry post-doctoral researcher working with Milliron. A paper reporting this researcher titled, “Modular inorganic nanocomposites by conversion of nanocrystal superlattices,” appears in the journal Angewandte Chemie International Edition and is available in Angewandte Chemie International Edition online. Co-authoring the paper with Milliron and Tangirala were Jessy Baker and Paul Alivisatos.